This Wednesday started out the same as every Wednesday. Get up, go to work, leave work, go to school, leave school, go home, sleep. Not terrible, but not exciting either. But a few different things happened this Wednesday. First and foremost, Chris was hosting game night. Which meant awesome geekiness and video gameage when I got home after 9. Then I went to class and the instructor was sick - so we were let go early. 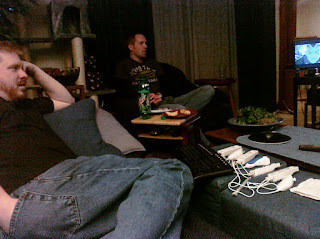 So I came home, did some little tasks, and listened to Chris, Jeff and Dan mock the Hulk movie that was on. Even Leki enjoyed having visitors. So much so that he made a new best friend. We played Marvel Ultimate Alliance 2, which has fantastically clunky controls on the wii (because we totally need to take advantage of the motion sensor for everything, right?! ), and had a lot of fun. It was a nice ending to the day. 345/365 - Happy Second Birthday Leki! 324/365 - Tasty Chilly Treats? 321/365 - Avatar Review? You Betcha!